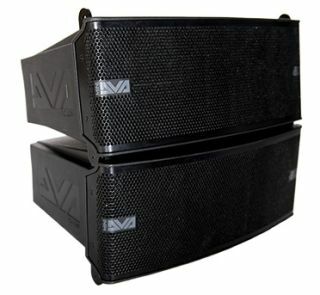 The What: The dB Technologies DVA MINI is a versatile system for both portable and permanent installation solutions.The What Else: The DVA MINI system is comprised of dual line array element modules, each with two 6.5-inch neodymium woofers and two 1-inch high-frequency compression drivers. The M2M module is the main module that contains the 400-watt Digipro G3 amplifier modules that power both the M2M and M2S slave module. The system achieves 126 dB max SPL per unit. dB Technologies’ engineering has developed a new fast-lock mechanic design, completely removing pins and mechanics, in favor or a quick-locking system. Simply place one module below the previous one and slide it towards one side until it locks in place. A single mechanic is on the rear of every single DVA MINI module allowing for incremental steps for line array positioning. The Bottom Line: The DVA MINI can be either flown or ground stacked. As an option, there is the DSA-M2 pole mount adapter that can handle the line array modules, helping the user to elevate the system to a reasonable height using a standard pole or speaker stand. When flown, up to four M2M + M2S modules and two MS12 subwoofer modules can be arrayed.